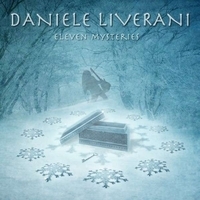 Daniele has since then been a very busy musician and released more then 17 albums, “Eleven Mysteries” counting number 19, in different genres ranging from instrumental rock, AOR, hard rock, rock opera to progressive rock & metal, so we can't accuse this musician of resting on his laurels. His most famous creations are including the rock opera “Genius Rock Opera” trilogy (guitar riffs, bass and keyboard), the progressive metal group “Empty Tremor” (keyboard player and composer), and the rock-AOR group “Khymera” (arranging and recording of the guitars, bass and keys). Last but not least and still my preference, and my first introduction to Daniele, is the prog rock & metal act “Twinspirits”, with Daniele in the leading role and on keyboards again. So his history goes far back with great moments in his music career, and so my expectations are increasingly high for the release of his latest instrumental rock piece entitled ‘Eleven Mysteries’. The music qualities of Daniele have a palette of many different colours, and with his background of playing piano and attending a classical school in his childhood, it has undoubtedly paid off and improved his strengths with such instruments as playing on keyboards and guitars, by applying all the classical experience from his earlier teachings. Apparently he thought it was about time now to dust of his beloved guitar and replace his keyboard again. So with this new solo effort ‘Eleven Mysteries’ he has surrounded himself with a very young team of blooming musical talents, consisting of Marco Zago (keyboards), Tony Dickinson (bass) and Paco Barilla (drums) and himself leading the bunch with his guitar performance. ‘Eleven Mysteries’ is an eleven track instrumental guitar oriented musical journey running through 52 minutes of various aspects of the human being our body, spirit and personality. It’s told by the fingers of Daniele on the strings of his guitar and a scary voice introducing some of the songs. The opening song ‘Mysterious Impulse’ is a fast and powerful demonstration of his shredding abilities, giving your ears no chance to rest. But the guitar riffs are all too dominating in the musical landscape, and it feels to emotionless at times. Next song ‘Inspiration’ is a more straightforward rock song, and the tempo is slowed down with an added grooviness and melody attached to it. This is one of those rare moments through out our journey, when Daniele and his crew are capable of keeping your attention as a hostage. Other songs with same star quality are ‘Supreme Gladness’ and ‘All is Pure’, both again following almost the same formula as ‘Inspiration’, with their mid tempo, groovy sound and the catchy melodies upfront. The guitar riffs by Daniele are tight, fast, dynamic and furious, that’s a fact, but they are also like vigorous waves from a tsunami hit washing over the musical landscape and drowning almost anything in their path. I’m convinced that many pure hearted instrumental shred lovers on our planet will dig this new solo effort. So if you see yourself belonging to that crowd, and have a strong desire to uncover the “eleven mysteries” regarding life, interpreted by Daniele, then don’t think twice about picking up this new piece of shredding goldness. It’s a concept beautifully told by the six magic strings of one of the precious wonders of this world…the guitar and Mr. Liverani.